Jaamil Olawale Kosoko is a Nigerian American poet, curator, and performance artist originally from Detroit, MI. He is a 2017 Princeton Arts Fellow, a 2017 Jerome Artists in Residence at Abrons Arts Center, and a 2017 Cave Canem Poetry Fellow. He lectures, speaks, and performs internationally. His previous work #negrophobia was nominated for a 2016 Bessie Award and has toured throughout Europe having appeared in major festivals including Moving in November (Finland), TakeMeSomewhere (UK), SICK! (UK), Tanz im August (Berlin), Oslo Internasjonale Teaterfestival (Norway), Zurich MOVES! (Switzerland), Beursschouwburg (Belgium) and Spielart Festival (Munich). Publications include: The American Poetry Review, The Dunes Review, The Interlochen Review, The Broad Street Review, Silo Literary and Visual Arts Magazine. In 2009, Kosoko published the chapbook, Animal in Cyberspace. 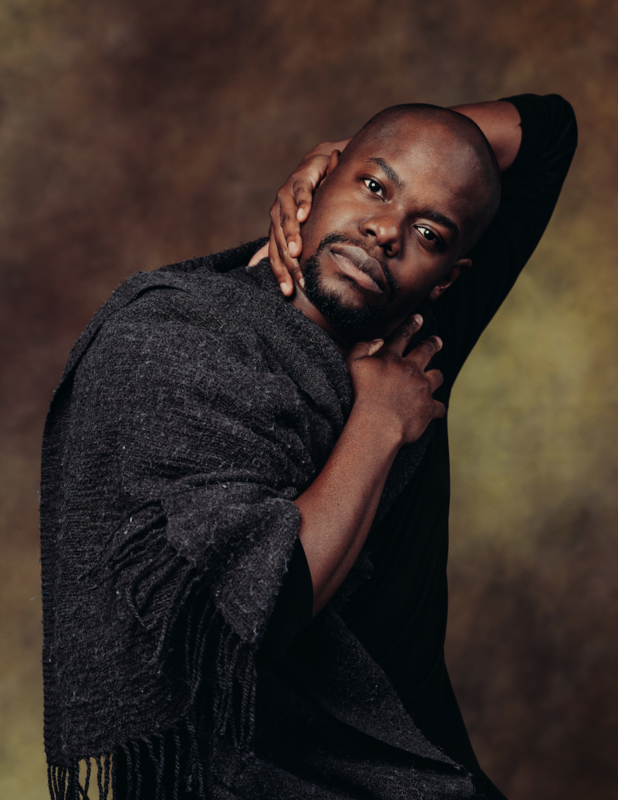 He was a Co-Curator of the 2015 Movement Research Spring Festival and the 2015 Dancing While Black performance series at BAAD in the Bronx; a contributing correspondent for Dance Journal (PHL), the Broad Street Review (PHL), and Critical Correspondence (NYC); a 2012 Live Arts Brewery Fellow as a part of the Philadelphia Live Arts Festival; a 2011 Fellow as a part of the DeVos Institute of Art Management at the John F. Kennedy Center for the Performing Arts; and an inaugural graduate member of the Institute for Curatorial Practice in Performance (ICPP) at Wesleyan University where he earned his MA in Curatorial Studies. Kosoko’s poems can be found in such publications as The American Poetry Review, Poems Against War, The Dunes Review, and Silo. In 2011, he published his own collection, Notes on an Urban Kill-Floor: Poems for Detroit (Old City Publishing). He has served on numerous curatorial and funding panels including the Brooklyn Arts Council, the National Endowment for the Arts, MAP Fund, Movement Research at Judson Church, the Philadelphia Cultural Fund, the Baker Artists Awards, among others. In 2014, Kosoko joined the Board of Directors for Dance/USA, the national service organization for dance professionals. He is also a founding advisory board member for the Coalition for Diasporan Scholars Moving. Performance Venues include: Joyce SoHo, Dixon Place, Dance Theater Workshop, Bennington College, Danspace at St. Mark’s Church, the CEC Meeting House Theater, Painted Bride Arts Center, among others. Creative consultant and/or performer credits include: Terry Creach, Lisa Kraus, Kate Watson-Wallace/anonymous bodies, Pig Iron Theatre Company, Keely Garfield Dance, Headlong Dance Theater, Leah Stein Dance Company, Emergent Improvisation Ensemble, and, Faustin Linyekula and Les Studios Kabako (The Democratic Republic of Congo, Africa). He continues to guest teach, speak, and lecture internationally. His work Séancers is currently touring throughout Europe and the United States.